Some get it, some don’t. Lets set the record straight. The US military has something similar called Death Before Dishonor, this is an adaptation of it loaded with symbolism. 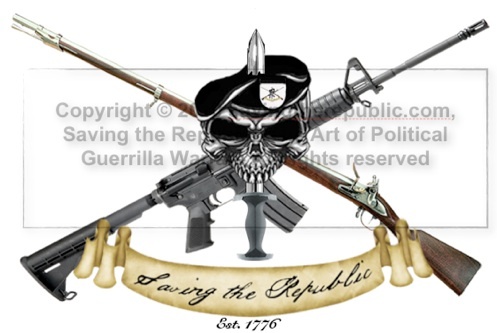 The crossed Musket and AR-15 (aka “Black Rifle”) are symbolic of the cause from the patriots of the old to the patriots of modern day America. Many contend what the colonies went through in dealing with the tyrannical English aristocracy rule we are now seeing once again. This time around from our own government, the Fed and even the media and special interest groups who have close ties with the power structure. The Dagger, Romanesque in design symbolizes our Republic type/structured government based originally off of Roman government. We are all the same down to the bone. The Beret is something seen throughout modern history being worn by the military but more importantly true revolutionaries (good and bad, unfortunately). It is conceivable that if such a design existed in 1776 we would have seen some paintings from that era depicting American patriots wearing a beret vs the tricorne style hat. Show your support for this site and more importantly your Republic and get one for yourself!